My mother and her best friend Debbie sent me this recipe several months ago declaring it was the best cake they have had in a long time. I believed them but hadn’t had the right time to make it until this weekend when my dear friends Masha and Aaron invited me over for dinner. Remembering that Masha loves sour cream so much she can eat it by the spoonful, I thought this cake frosted in a mixture of whipped cream and sour cream was perfect. I was unsure exactly what “clabber frosting ” really was. It turns out clabber “is a food produced by allowing unpasteurized milk to turn sour at a specific humidity and temperature” according to Wikipedia. I’m pretty sure that is what sour cream is – but I’m not positive. Either way, this mixture is an interesting and less sweet frosting – which is surprisingly more refreshing than the typical butter cream. You can eat a much bigger piece of cake because it is less sweet and filling … although I’m not sure that is a good thing. My mom and Debbie were right, this cake is a keeper. from heat and let totally cool. Frosting – Combine cream, sour cream, and six TBSP sugar and whip to fluffy. 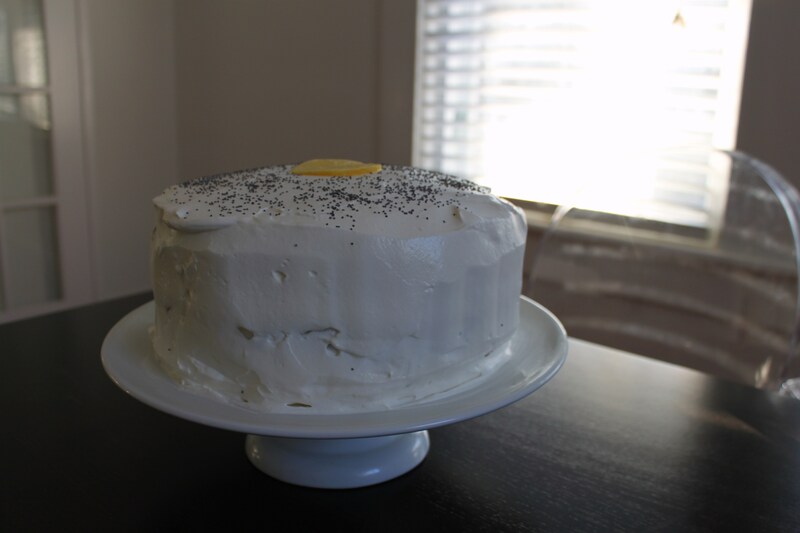 To put cake together – After completely cool, put down first layer, smear all lemon filling. Put second layer and frost. That’s it! Piece of cake! We told you it was amazing. I am wanting a piece right now. This is my new favorite cake!